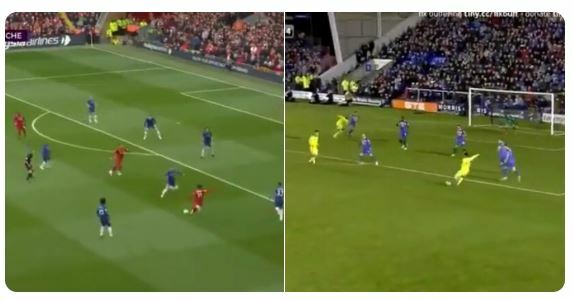 Mo Salah is slyly a bit of a Chelsea legend. Let’s not forget he played and scored in the legendary 6-1 crushing of Arsenal, and also that he was in the XI for the legendary Gerrard slip game in 2014 – but playing for us and not Liverpool. One of the moment that summed up his time at the Bridge best was his utterly legendary shot against Shrewsbury in the Carabao Cup, where he skewed it out wide for a throw in after attempting to smash. His goal against Chelsea was from exactly the same place, but flew into the top corner. An amused Twitter user compared the two, and really you’ve got to laugh. Who would have thought he would end up like this? ?